Purchase original Robert Heindel paintings made available, from time to time, by the artist's estate or private sellers known to the estate. Please use the contact us button if you are interested in learning more. Created: 2002 Medium: Oil on board Measures approximately 33 inches wide by 48 inches tall (Direct sale from the Estate of Robert Heindel) A single female dancer from the ballet Arthur, choreographed by David Bintley. The legend of King Arthur has been told and re-told for centuries in books, song, poetry and film. In 2002, David Bintley completed his ballet cycle, thus two full length works 'Arthur' I & II which interpreted through dance the Camelot story. For two years Robert Heindel followed the Birmingham Royal Ballet in both their home city and to Sadler Wells in London in order to see the extensive work evolve in its entirety. 'Arthur' provided a wealth of serious, rather sobering material and in doing so provoked some of the most profound panels Heindel ever painted. Many dealt upon the mood of the central characters, their passion, their hatred and ultimately hopelessness. Painted primarily in dark tones that captured the theatrics of stage and lighting, occasionally the artist would allow the shock of red to mirror the intensity of a pas de deux. The paintings and drawings from Arthur were created in the studio from 2000 onwards; they represent the largest body of work, over sixty pieces, from a single ballet. 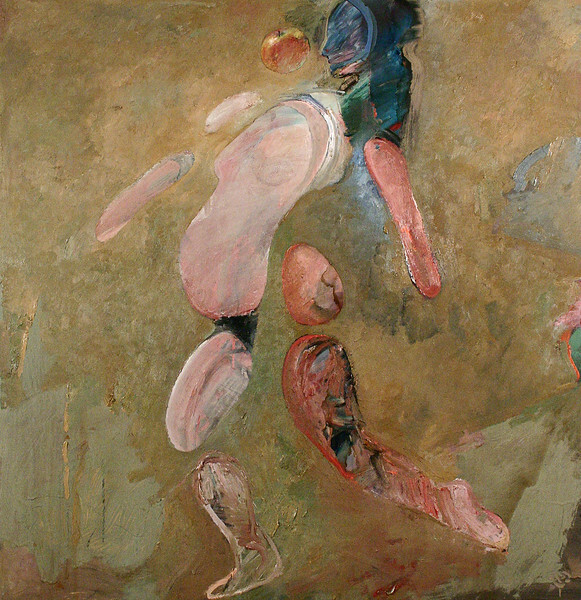 Created: 1993 Medium: Oil on Vellum Measure approximately 34 inches wide by 35 inches tall (Estate of Robert Heindel) Heindel integrated the bones of a bird’s wing with the form of a dancer for Gloria VI, one of only four original paintings created for Sir Kenneth Macmillan's Gloria ballet, a haunting tribute to the young men who perished in the trenches of the First World War. The spectral figures of the women left behind by the tin-hatted soldiers are seen here in a pinkish mist of remembrance, entwined with their men or curled around themselves like fetuses. A perfect echo of the ballet's lament for the heartbreaking waste of life when men go to war. Created: 2004 Medium: Oil on board Measure approximately 44 inches wide by 45 inches tall (Direct sale from the Estate of Robert Heindel) This is one of the last four paintings that Robert Heindel worked on prior to his death in 2005. Heindel is perhaps best known for his paintings of ballet dancers. This painting combines elements of his dance and abstract works in this unique and stunning depiction of Eve, the first woman and the original sin. Created: 1996 Medium: Oil on board Measures Approximately 48 inches wide by 48 inches tall (Private Sale - Estate introduction to seller) A rare opportunity to own an original Robert Heindel abstract painting. Painted Wall #32 is one of ninety-one abstract paintings created by the artist between 1995 and 2003 in the painted wall series. A powerful example of late twentieth century Color Field painting, Painted Wall #32 held special meaning to the artist. The black stripe on white background represented the the artist’s eldest son Toby who died of cancer at age thirty. The white stripe represented the artist, immediately followed by a pink stripe, which represented his wife Rose, whose rose symbol was also used as his unique signature on this and many other original works by the artist. 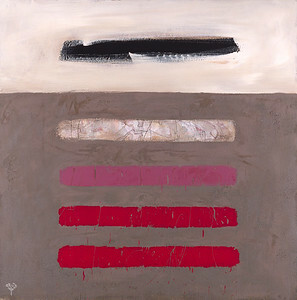 The remaining two red stripes represented the artist’s remaining living sons Troy and Todd. 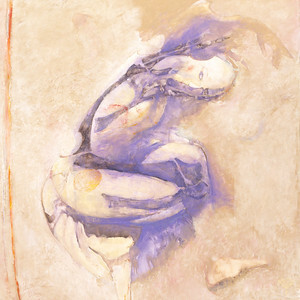 For Heindel, an artist widely acclaimed as the greatest painter of dance since Degas, these rarely available abstract works represented humanity’s struggle for life, love and meaning. Created: 1990 Medium: Mixed Media Measure approximately 15 inches wide by 24 inches tall (Private Sale - Estate introduction to seller) The inspiration Heindel yielded from Scottish Ballet started in 1990 and stayed with him for the rest of his life. For almost 15 years he would return to the impressions left in him from observing ‘Who Cares?’, Belong and Forgotten Land. During his very first visit to the Glasgow studios of Scottish Ballet, Balanchine’s ‘Who Cares?’ was being rehearsed. As was often the case, the artist made a series of early sketches before embarking upon major paintings. This study is certainly one of the very first. 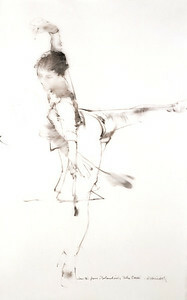 The image was used in conjunction with Scottish Ballet’s 1990 tour of the Far East. This is one of the last four paintings that Robert Heindel worked on prior to his death in 2005. 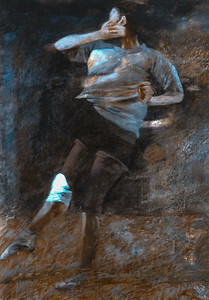 Heindel is perhaps best known for his paintings of ballet dancers. This painting combines elements of his dance and abstract works in this unique and stunning depiction of Eve, the first woman and the original sin.